Whoops, accidentally took a little break from the blog, but here I am again! 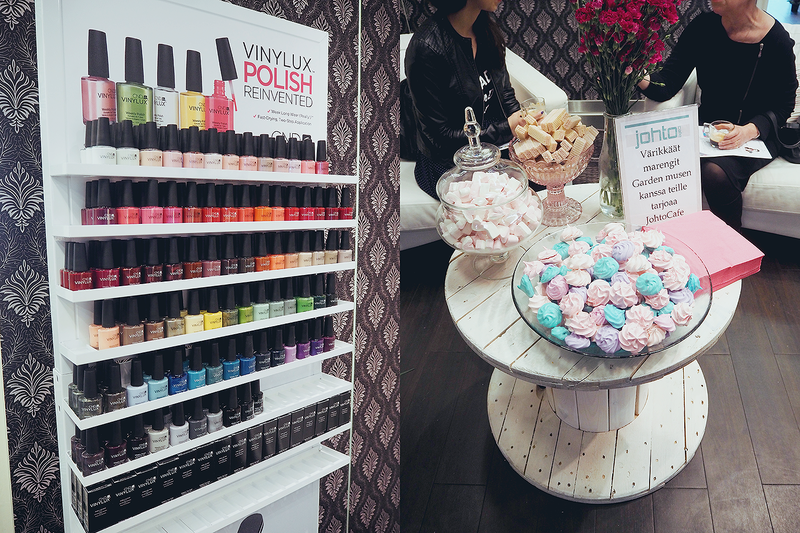 Back in April, I got invited to a CND Shellac/Vinylux press event to check out the new summer collection! 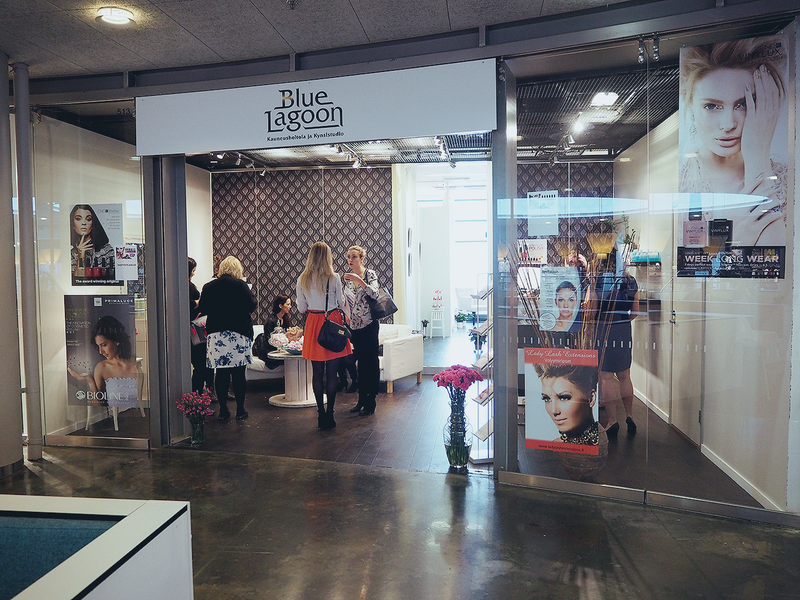 The event was held at Blue Lagoon beauty salon in Kamppi and as the nail freak I am, it was so cool to get to check out all the new colors is person! A few pics from the event above. I was familiar with Vinylux since we have it in our selection at CesarsShop, but Shellac is (unfortunately) available only for those who have had their training by CND. Anyways, I got a giftcard for one Shellac treatment, so I thought why not as well use it! Never have I ever had my nails done by someone else, so it was an interesting experience as well :D The giftcard only consisted gel polish treatment, so the nails are still sculpted and decorated by me. Here's me getting my nails done! :D The lamp was smaller than the tunnel lamp I have at home, so I could barely fit my nails in it but well, it worked anyway haha. I wanted to have a milky white, slighty transparent color on each nail, so we used 2 coats of Shellac Studio White (semi-sheer white) and one coat of Shellac Negligee (sheer pink/blue shimmer). The shimmer is really subtle though and visible only in direct sunlight. Check out the last pic in the post for reference. The whole thing took about 45min to do. 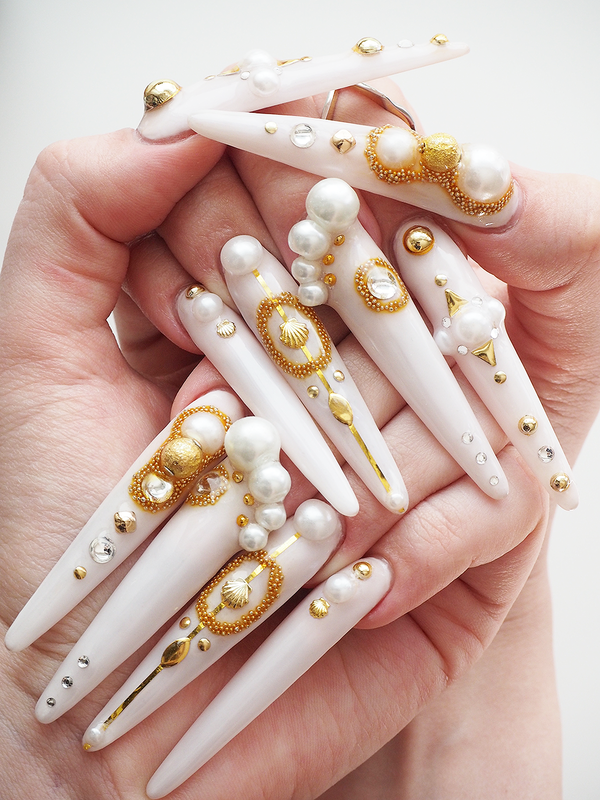 The nails looked pretty crazy with only the white gel polish on them, so after I got off of the studio, I went to buy some big pearls and other nail deco stuff and headed home to do the decorating part. Let's see how that turned out! Tadah! What do you think? I think they're pretty different compared to my previous nail designs and this is probably the first time ever when I have same color on every single nail :D I kept the color scheme simply white & gold and I think I'm ready to welcome the summer with these! 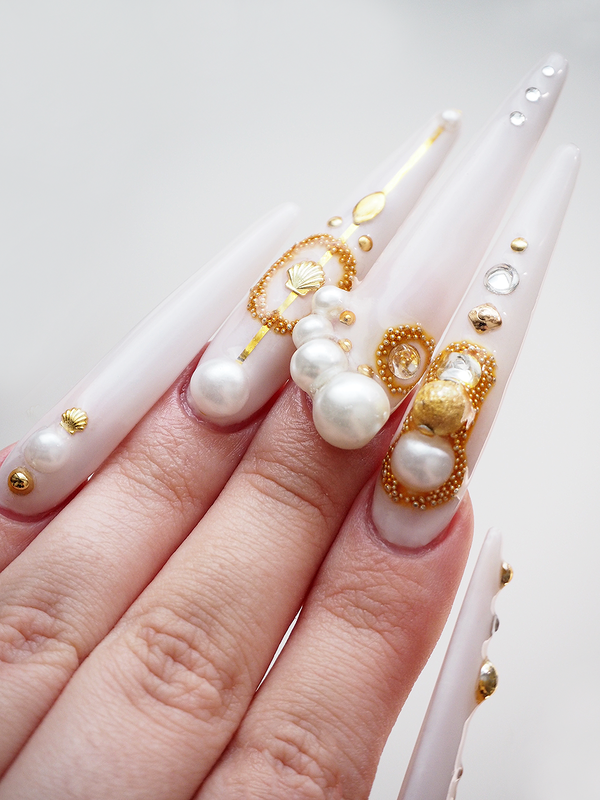 Also.... turns out the big pearls on my middle fingers are too big to fit any rings on those two fingers :'D Oh well... This was the first time this has happened btw! But I think they look a lot better than when I tried to do a similar design with smaller pearls, so I guess that's okay lol. 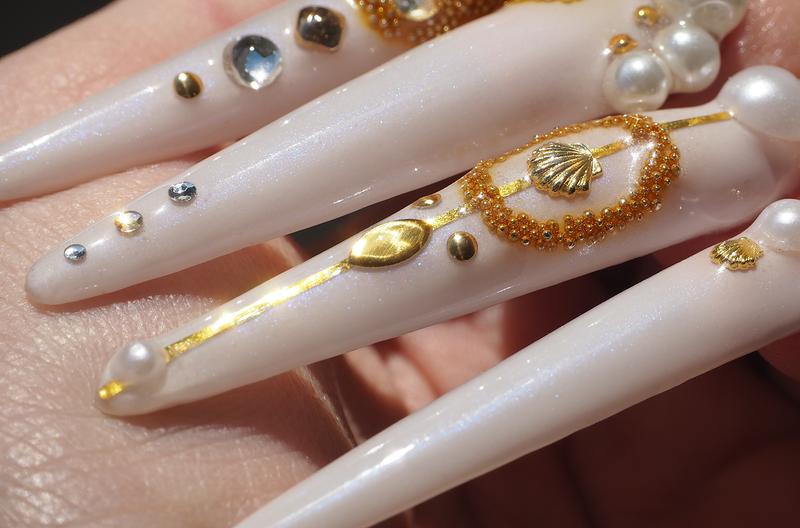 I don't know what I was thinking when applying the finishing gel though, because I applied it over the Swarovski too and they ended up looking like random blobs... And I only noticed it after I had finished the nails, so... :'D I guess it doesn't look too bad. Here's how the gel polish looks like in sunlight! You can see it has a small blueish pink shimmer to it, which gives it a luxurious feeling, hihii. Thank you Blue Lagoon! Please let me know your thoughts if you have any! 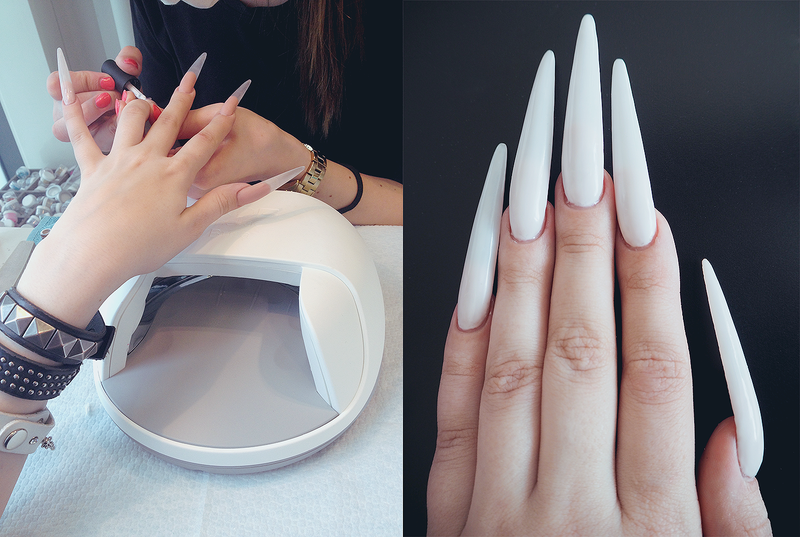 Also let me know what kind of nails you prefer for summer? Voi elämä miten kaunis tuo valkoisen sävy on kevyellä shimmerillä! Ilman koristeita noita kynsiä saattaisi kyllä erehtyä luulemaan vaikka kertakäyttölusikoiden varsiksi :D. Isot kynnet, isot koristeet!!! Eikö olekin outoa, kun kaikki kynnet on lakattu samalla lakalla. Koristeet toki auttaa asiaa ja joskus koristuksista tulee nätimmätkin näin, kun ne pääsevät pääosaan. Ei näitä koskaan väsy tuijottamaan <3. Ite oon just menossa torstaina hankkimaan uudet kynnet ja oon vielä ihan ulkona et mitä väriä tahtoisin... On niin paljon kaikkea, mikä sopis kesään! 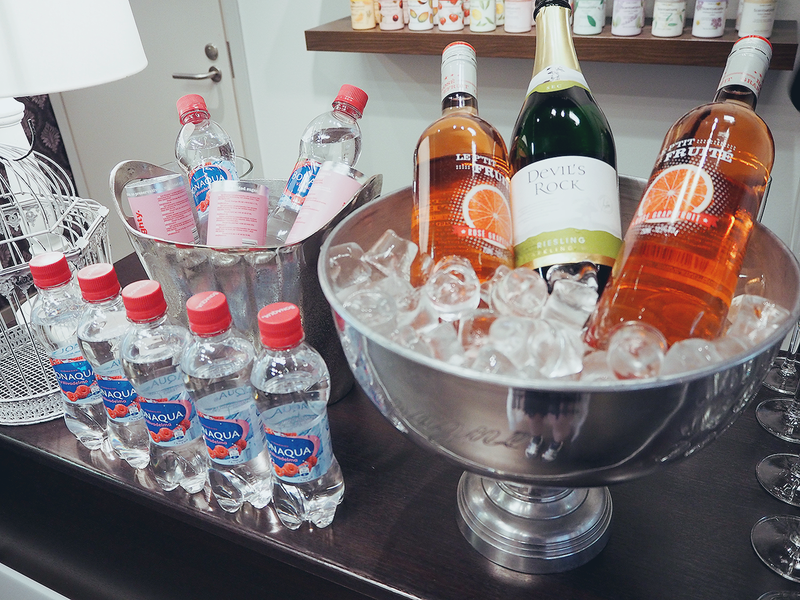 looks so elegant and beautiful~ I'm jealous you can do such treatments at home! Crazy cool, I love it. I love the nail art you do on your nails. These are fantastic!